Description: Stevenson, Robert Louis -- Autograph Quotation Signed. (1850-94) Scottish novelist, poet, and essayist, best known for Treasure Island, Kidnapped, and Strange Case of Dr. Jekyll and Mr. Hyde. Autograph quotation signed, " All human poetry is merely declaratory. Robert Louis Stevenson / Vailima.," on 1 1/2 x 3" piece of paper, n.d. This quotation is form the story Stevenson wrote in 1878 "The Gospel of Walt Whitman" Stevenson lived in Vailima, Somoa from 1890 until his death in December 1894. Boldly penned and signed. 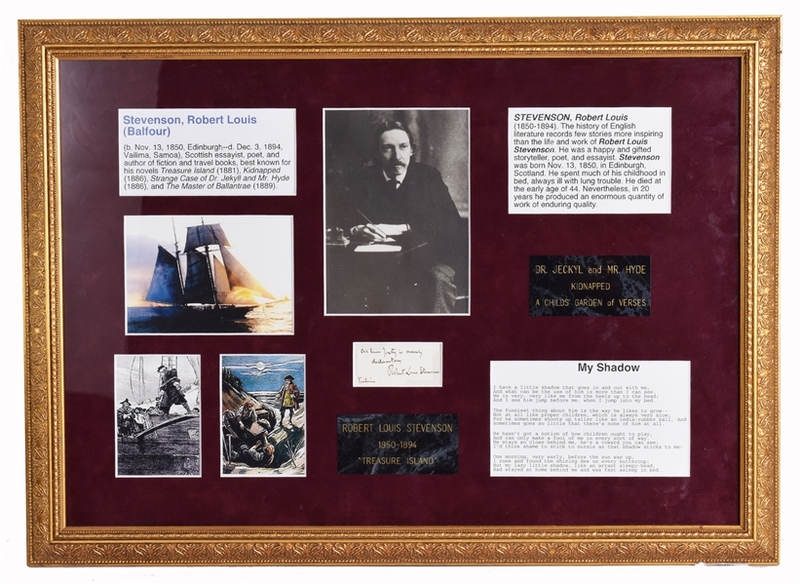 Matted with a photo of Stevenson, a printed copy of the poem "My Shadow," biographical information, and other items to an overall size of 18 x 22".